Success in implementing evidence-based programs and practices in social emotional learning requires careful planning to guide implementation and a commitment to ongoing quality improvement and evaluation. At 3DL, we partner with schools and youth organizations to help them succeed at all phases of the implementation process. 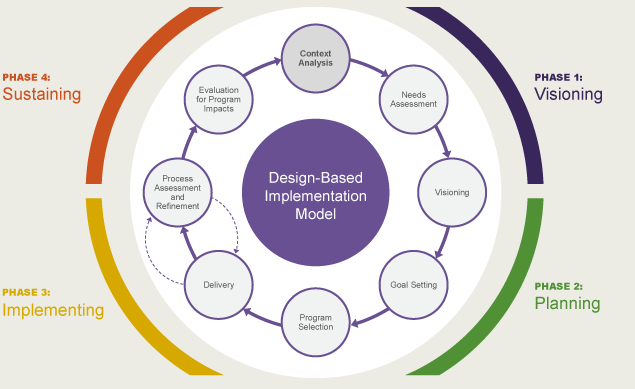 The 3DL Framework for Visioning, Planning, Implementing, and Sustaining quality SEL programs builds on principles and practices of implementation science and Design-Based Implementation Research. Both underscore the value of collaboration, data-driven decision-making, and ongoing refinement of programs to support program quality and sustainability.